This is a Carriage House Farm favorite. We look forward to the arrival of garlic scapes mainly so that we can make this dip and smear it on good crusty bread (Sixteen Bricks ciabatta is our favorite) or scoop it up with pita chips. Today we're using veggie bites. 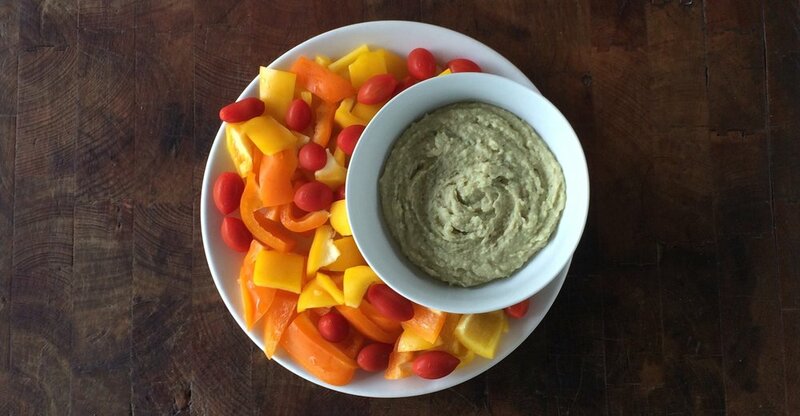 So much of the food we make on the farm can handle substitutions, but for this dip there's no point. The point is the scapes. They're available at market for a week or two and then they're gone. So, this is special treat once a year. Process lemon juice and scapes until the scapes are finely chopped. Add beans and process to a rough puree. Add olive oil and process until fairly smooth. Add salt and pepper and more lemon juice to taste. Add honey if you like--a little bit at a time. There is a person on our team who believes that a little bit of honey makes everything taste a little rounder and little more like itself. This is not a fully proven theory, but the food she makes is pretty good.